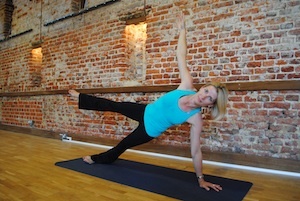 Sharon Robinson is a qualified, Farnham-based Pilates instructor, who has over 12 years’ experience of teaching Pilates. She began practicing Pilates more than 20 years ago following a series of sporting injuries which weakened her back. Pilates had an extremely positive effect and has helped to prevent further injuries. Sharon then went onto have three children, so has a real insight into how Pilates can help both during pregnancy and afterwards in terms of re-gaining posture and tone. After training with Pilates Training Solutions, one of the country’s foremost accredited training companies, she launched Pilates for Fitness in 2006 and has helped more than four hundred clients achieve their personal fitness goals, and helped them make Pilates part of their daily life. Many clients are referred to Sharon by physiotherapists and GPs following diagnosis of back injuries. We currently run Pilates group classes in Farnham & Odiham and private classes for up to 6 people in the surrounding areas. Get in touch for details or see our classes page.